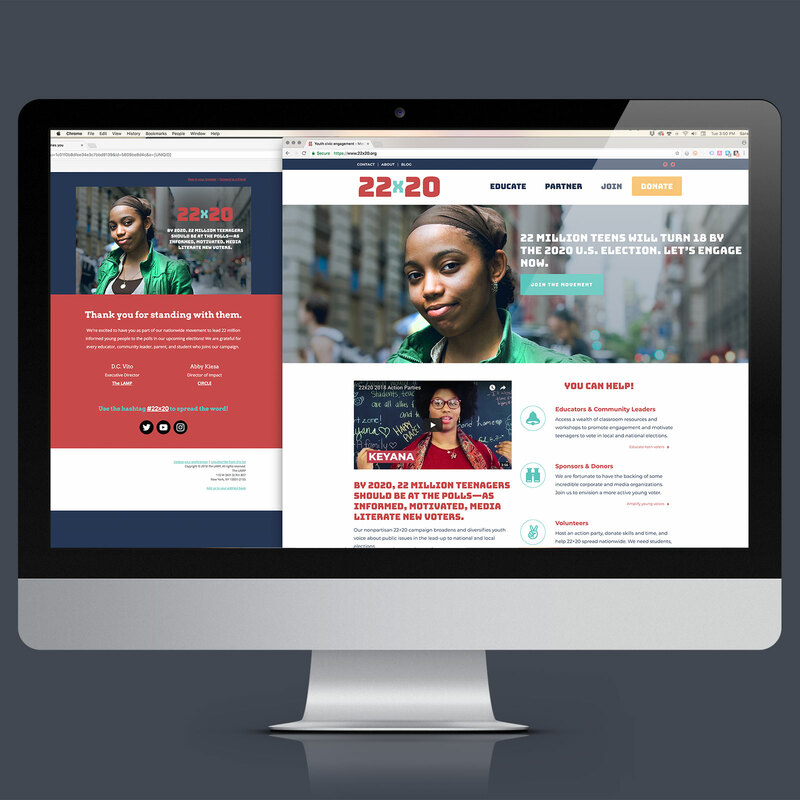 The 22×20 campaign’s goal is to inform and lead 22 million voting-age teenagers to the polls in upcoming U.S. elections. By partnering with community leaders, educators, students, and corporate sponsors, this talented team of changemakers aims to stimulate curiosity and disavow misunderstanding among young people about the political process—particularly the importance of each voice. 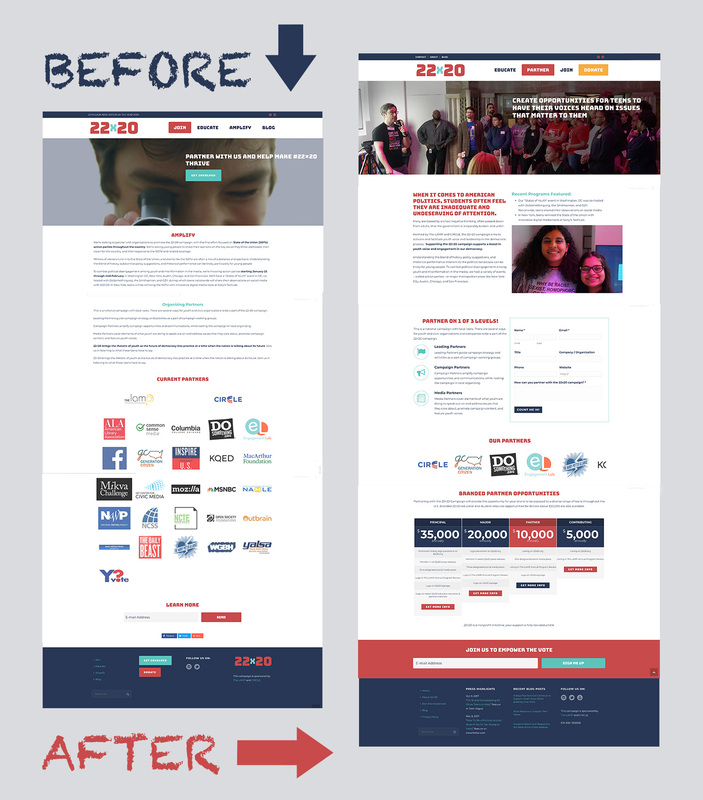 The 22×20 campaign website had been hurriedly launched in preparation for State of the Union events in January 2018. 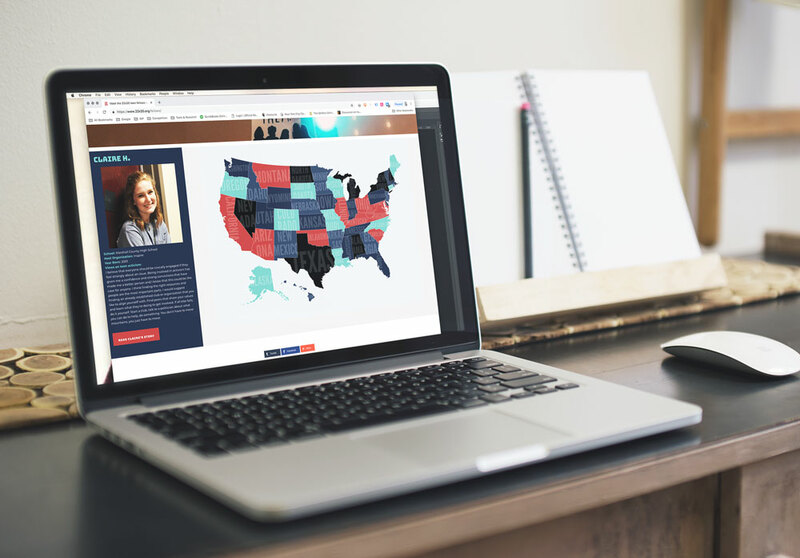 Unfortunately, the website’s content lacked strong calls to action, navigational and anchor elements were buried or missing, and worst of all, the brand identity wasn’t reflective of the energetic voices of the people running the campaign. They thought they needed help with cause marketing—we knew we’d have to do a bit more than that to hit this very timely campaign’s potential. Following a couple initial discovery meetings to discuss brand, we performed an audit of the campaign’s existing print pieces, website, and email marketing. 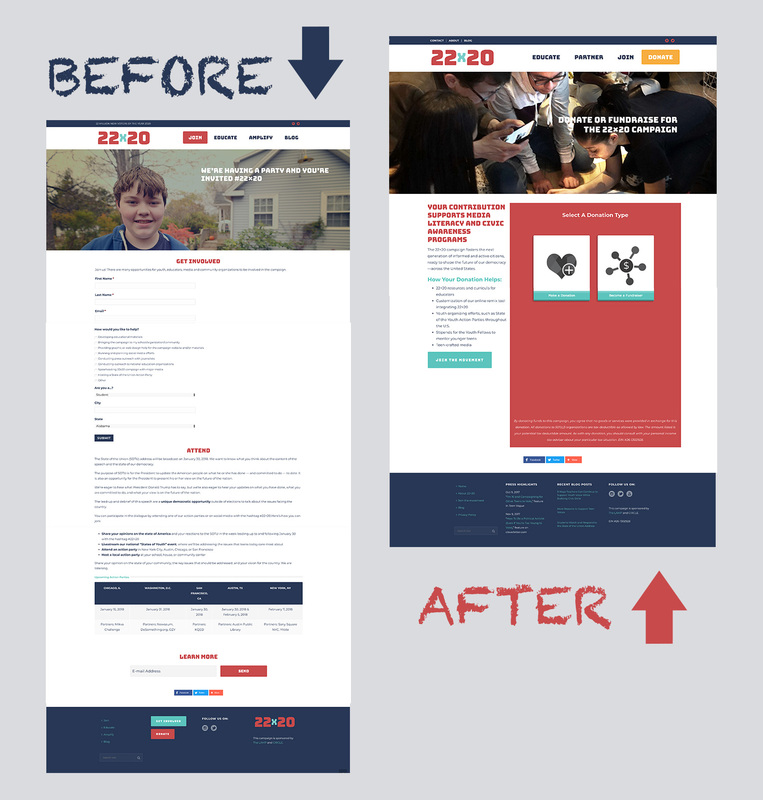 We devised a content strategy by which to revamp elements of the website so they would better accentuate the attributes of the brand and staff, encourage click-through and action from visitors, and build ongoing community around the campaign. We compiled everything they gave us to build a better website that could then be more useful in long-term cause marketing efforts. Since sponsorship was a huge goal, we aimed first at legitimizing the brand by way of the website. 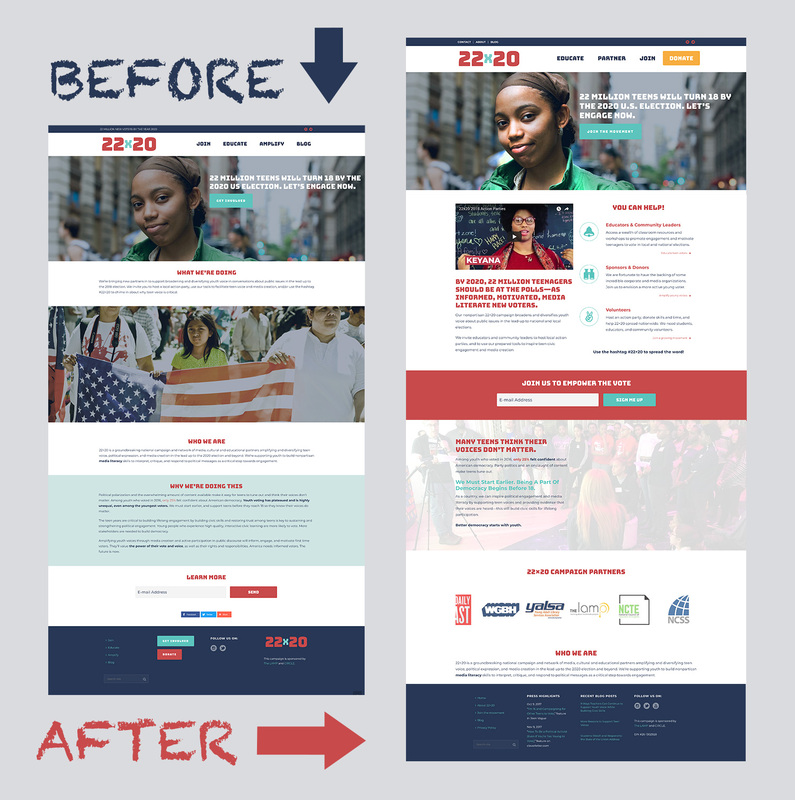 We reworked the existing pages to better structure them, replacing long-form intellectual-style copy and dull images with emotive headlines, brightly colored icons and links, high-contrast / retouched photos from campaign events (rather than stock art), and interactive elements like forms and videos. The site did not have any SEO in place; we added descriptive page titles, meta tags, ALT tags, and submitted sitemaps to major search engines. We implemented Google Tag Manager to provide Events-based tracking, and tied Google Analytics in to their donation software campaigns. We’ve added an interactive map to highlight student activism within the campaign nationwide. 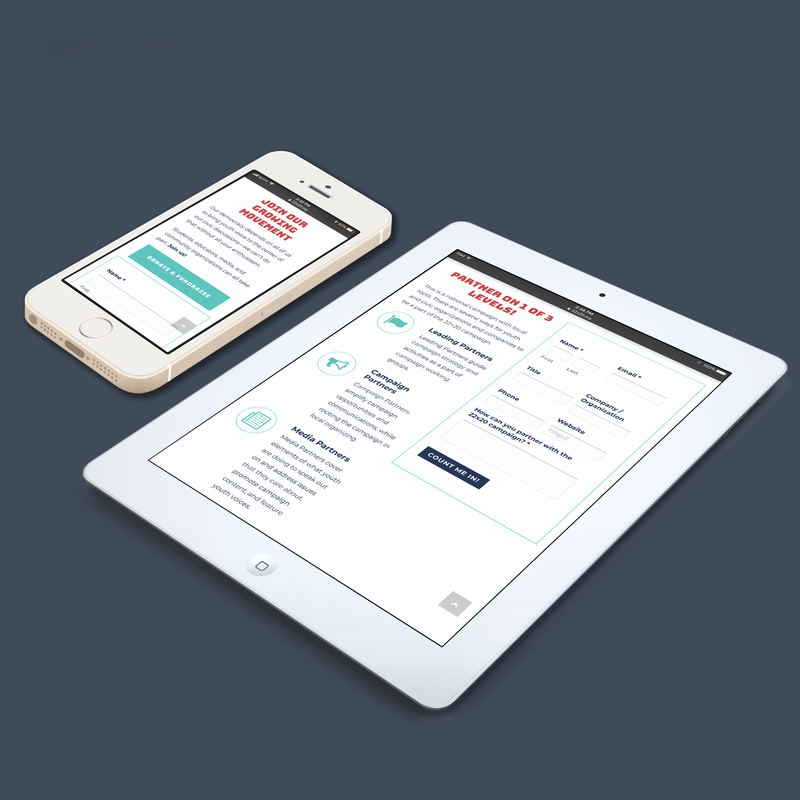 We created clearer navigation in the header, main menu, and footer. Content strategy, including fine-tuning website content and SEO efforts, organizing a blog posting schedule and promotion, and adding additional content, including new pages geared toward students, press / media, and others. Email marketing strategy, including calendaring updates, promoting latest blog posts, and template design. Social media strategy, including Canva graphics templates (avatars, quotes, etc. ), posting schedule, and messaging. Consulting on PR strategy, developing print pieces, and any other collateral or strategic needs that should arise.